The program is designed for service works with the printer Canon MP-Series Low-Level mode at the moment are supported: MP150, MP160, MP170, MP180, MP450, MP460. Expanded information on the level of ink in the cartridge and containers for the waste of ink. Reading, recording and reset the printer EEPROM. Resetting counters level black and coloured ink cartridges. Clear the counters occupancy “core” and “supplementary” containers for the waste of ink. Subsection Reset Counter – Ink Counter. Reset Black – zeroing meter level black ink cartridge. 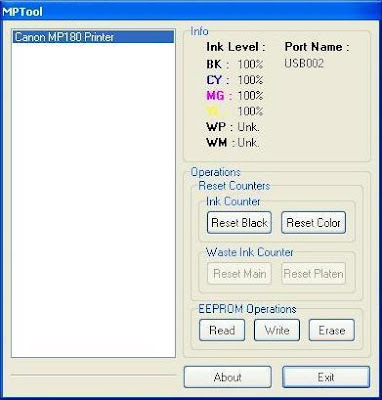 Reset Color – zeroing meter level of colour ink cartridge. Subsection Reset Counter – Waste Ink Counter. Reset Main – zeroing meter level occupancy ink “main” containers for the waste of ink. Reset Platen – zeroing meter level occupancy ink “additional” container for the waste of ink.